BENTONVILLE, AR, and BURBANK, CA – April 24, 2013 – Superman fans, mark your calendars! Walmart announced today that it has partnered with Warner Bros. to give its customers exclusive access to see Warner Bros. Pictures and Legendary Pictures’ “Man of Steel” in theaters nationwide before the film’s official release. This program marks the first time in entertainment history that a studio has partnered with a retailer to provide such an opportunity for fans. 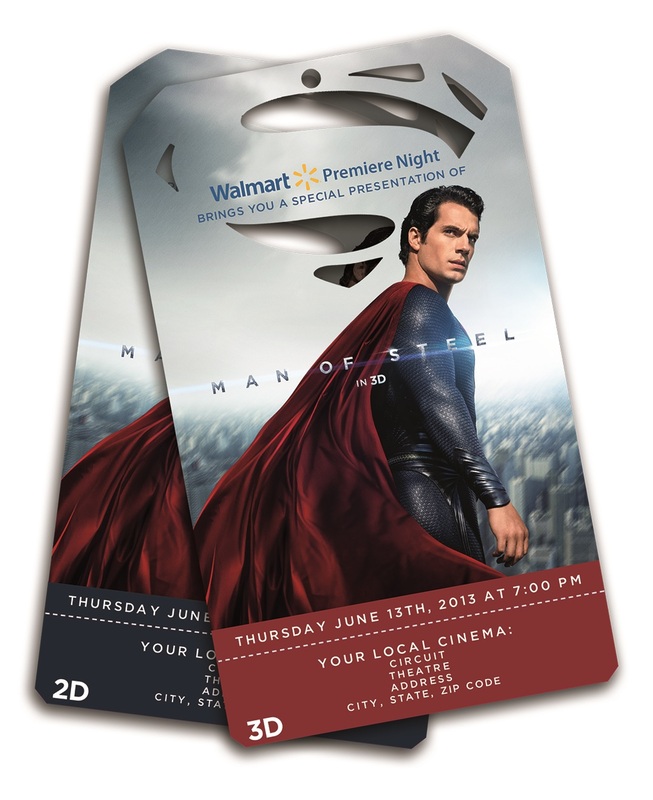 Tickets for the exclusive screening of “Man of Steel,” will go on sale in more than 3,700 Walmart stores starting at 8 a.m. on May 18. Customers will be able to purchase up to four tickets per visit, and have the option to choose between 2D or 3D showings, where applicable. The advance screening will take place in selected local theaters nationwide at 7 p.m. on June 13. Priority Purchase of Blu-ray Combo Pack or HD Digital Download: Each ticket bought at Walmart will feature a code on the back that allows customers to pre-order their own Blu-ray Combo Pack or HD Digital Download of “Man of Steel,” which will contain exclusive film content. Official “Man of Steel Experience” Mobile App: Fans can bring Superman to life with the official “Man of Steel Experience” augmented reality app. The app allows customers to take photos with the superhero, as well as unlock special photo frames by pointing their phone at “Man of Steel” signage in their local Walmart. To download the app please visit: Apple App Store or Google Play. Exclusive Original Digital Comic Book: Customers will receive a free original Digital Comic Book written by “Man of Steel” screenwriter David Goyer with every ticket. “Man of Steel” Merchandise: Beginning April 28, a variety of “Man of Steel” merchandise such as t-shirts, electronics, posters and more from top brands will be available at Walmart stores and at Walmart.com. Walmart invites customers to join the conversation and show their excitement for the first screening of “Man of Steel” on Facebook and on Twitter with the hashtag #SeeSteelFirst. For more information and to view the selected theaters please visit: www.walmart.com/ManofSteel. From Warner Bros. Pictures and Legendary Pictures comes “Man of Steel,” starring Henry Cavill in the role of Clark Kent/Superman, under the direction of Zack Snyder. A young boy learns that he has extraordinary powers and is not of this Earth. As a young man, he journeys to discover where he came from and what he was sent here to do. But the hero in him must emerge if he is to save the world from annihilation and become the symbol of hope for all mankind. Wal-Mart Stores, Inc. (NYSE: WMT) helps people around the world save money and live better – anytime and anywhere – in retail stores, online, and through their mobile devices. Each week, more than 245 million customers and members visit or more than 10,700 stores under 69 banners in 27 countries and e-commerce websites in 10 countries. With fiscal year 2013 sales of approximately $466 billion, Walmart employs more than 2.2 million associates worldwide. Walmart continues to be a leader in sustainability, corporate philanthropy and employment opportunity. Additional information about Walmart can be found by visiting http://corporate.walmart.com, on Facebook at http://facebook.com/walmart and on Twitter at http://twitter.com/walmartnewsroom. Online merchandise sales are available at http://www.walmart.com and http://www.samsclub.com.